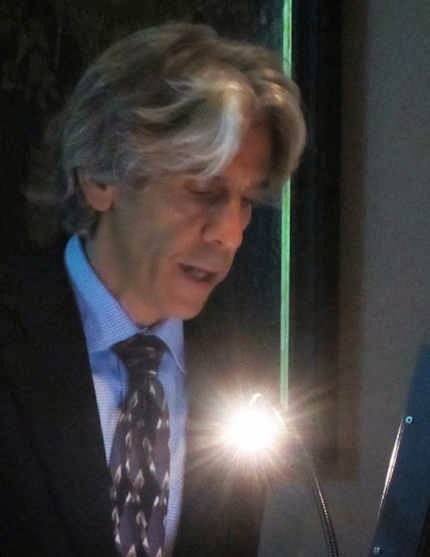 In 1991 a restorer brought Professor James Beck of Columbia University to trial in four Italian cities on charges of aggravated criminal slander. (Beck’s comments to one journalist had been carried in four regional newspapers.) Facing a possible three years jail sentence and ruinous, punitive damages – the restorer demanded 60 million lire for “material and moral damages” – Beck was exposed, vulnerable, alone. 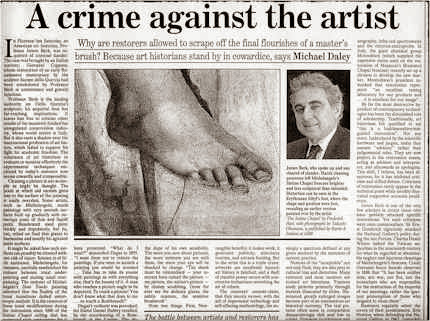 The restorer had sued Beck but not the four newspapers that had carried the allegedly damaging comments by the world’s leading authority on Jacopo della Quercia, whose famous marble carving in Lucca Cathedral, The Ilaria del Carretto, had been stripped of its ancient patina in a “conservation treatment” that included being blasted with particles to remove abrasions and scratches and saturated with penetrating oil to produce a homogeneously shiny surface (see Figs. 2 and 3). Despite the awfulness of the restoration everyone expected Beck to lose. One person who knew that he was going to lose – the trial judge in Florence – told the prosecuting lawyer as they left the court building together for lunch on the first day of the trial that he would find the scholar guilty: “Eh, but I shall convict him”. Fortunately, that declared intention was overhead by an intern-lawyer and former policeman who happened to be working for Beck’s own lawyer. The judge and the lawyer disputed the attributed words but not the fact that they had left the court talking to each other about the case. Despite their joint denial, eventually, the judge was replaced and Beck was acquitted. (The story of that trial is told in the book “Art Restoration ~ The Culture, the Business and the Scandal” by James Beck and Michael Daley.) By then, Beck had resolved to set up an international organisation dedicated to speak and act on behalf of art against harmful practices and abusive or exploitative treatments. ArtWatch International was founded in 1992 to be that organisation. When Beck died in 2007 we knew that the best way to honour his courageous stance was by continuing to campaign through ArtWatch. 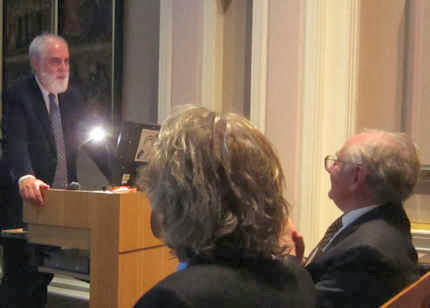 At the same time, to commemorate his achievements as a rigorous (Rudolph Wittkower-trained) scholar and highly popular teacher, we instigated an annual memorial lecture, alternating between London and New York, to be given by scholars of high esteem. 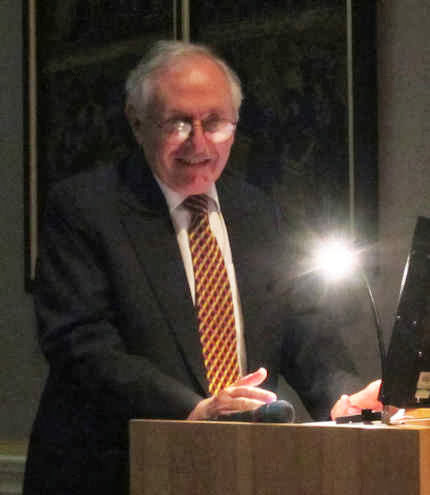 We have been honoured by talks from Professors Hellmut Wohl and Charles Hope in London in 2009 and 2011, and by Professors Mark Zucker and David Freedberg in New York in 2010 and 2012. 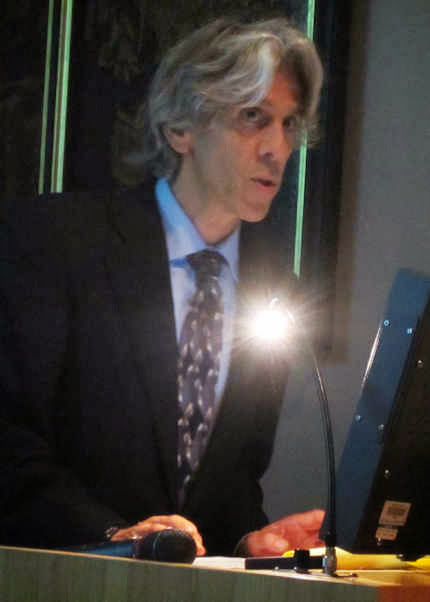 Martin Eidelberg expresses the hope that his own essays will find a readership, encourage others’ research, lead to stimulating conversations on the art of Watteau and his circle. 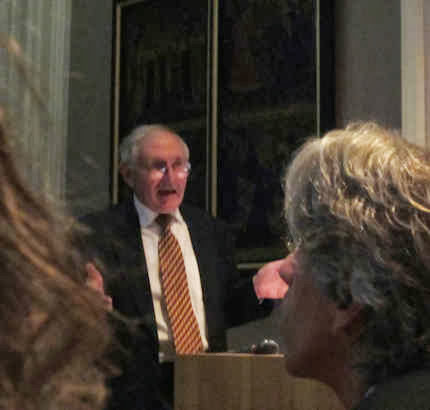 Certainly, his lecture on the 30th left the (distinguished) audience delighted and flattered to have been party to so discriminating and illuminating a conversation. 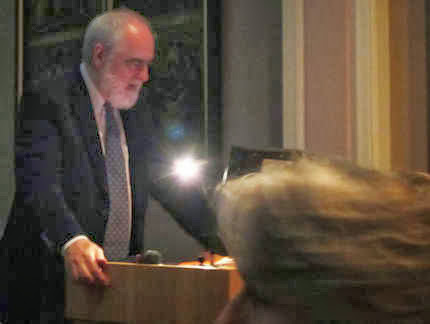 Given the talk’s rarified subject it seemed appropriate to ask a specialist in the field, Selby Whittingham, who is Secretary of the Watteau Society, Donor Watch and The Independent Turner Society to offer a note on the speaker and his researches. 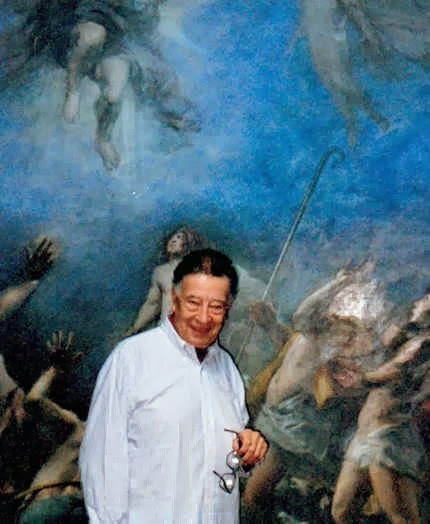 “It is 29 years since I first met Martin Eidelberg at the colloquium at Paris to celebrate the tercentenary of Watteau’s birth, to which we both contributed, Martin on Watteau and his early master, Gillot. 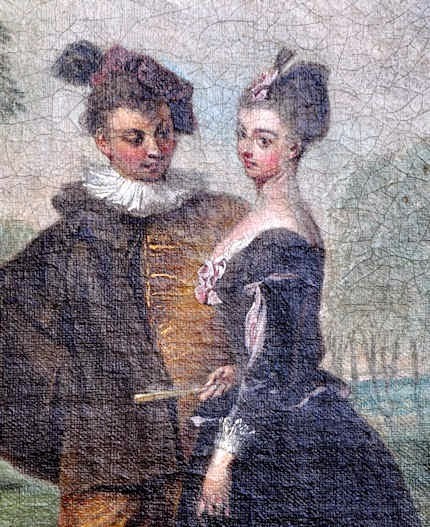 The speaker immediately preceding myself, Brian Allen, spoke about early imitators of Watteau in England, of whom “easily the most important” was Philip Mercier. 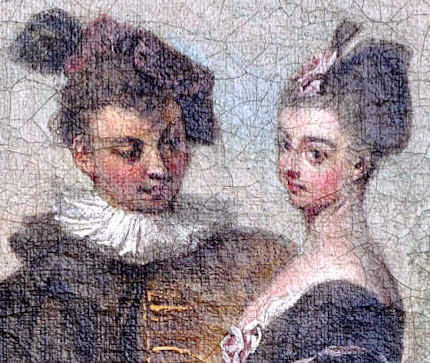 Fifteen years earlier John Ingamells and the late Robert Raines, a founder member of the Watteau Society in 1984, held an exhibition on Mercier at York Art Gallery, followed by a catalogue of his works published fittingly by the Walpole Society (Horace Walpole having owned an actual Watteau, now at St Petersburg). The earlier ArtWatch talk to which Selby Whittingham refers was much appreciated by James Beck. As well as providing a platform for good talks, Artwatch soon discovered that people feel freer to approach and pass on intelligence to a dedicated organisation than to individuals. One of the first to do so was Nick Tinari, a young electrical engineer and devoted student at the Barnes Foundation in Merion, Pennsylvania. He brought news of an attempt to overturn a prohibition on loans of art works from the Barnes Foundation’s fabulous collection of modern paintings. This, indeed, was alarming: tours not only constitute greatly increased risks (six-fold in the judgement of one insurer) but too often serve also as pretexts for “conservation treatments”. With the Barnes collection (as with that of the Sterling and Francine Clark collection – see “Taking Renoir, Sterling and Francine Clark to the Cleaners”), the now-at-risk paintings were in the best, which is to say, least-restored conditions. The justification for the proposed breach of a fabulously generous donor’s wishes and conditions was that money could be raised through a foreign tour of key works in the collection to make “conservation” improvements to the building in which the collection was housed. Alleged conservation needs provide morally-coercive cover for many professional expansions and building projects. Tinari saw the proposal as a ruse contemptuous of Barnes’ intentions and philosophy. Events proved him right – the assets of an institution were effectively hi-jacked and its educational purpose greatly subverted. The story of that heist has been well told (and see Tinari’s own comments below). Less sufficiently appreciated is Tinari’s own remarkable and tenacious defence of Barnes’ wishes and instructions against the hot-shot lawyers of the would-be institutional transformers. Those encounters so sharpened his awareness of and appetite for the law that he turned to law school himself and now works as a patents attorney. Artwatch has always seen itself as something of a standard bearer and supporter of other worthy autonomous campaigns on Art’s behalf. James Beck had great fondness for courageous campaigning individuals and created a small prize which he named after the New York painter Frank Mason. Mason, a longstanding and popular traditionalist teacher at New York’s famous Art Students League (among his student/devotees was the great American satirist and author of “The Painted Word”, Tom Wolfe), was a pioneering anti-restoration figure in the US, leading marches of artists and students at the Art Students League to the Metropolitan Museum in protest at its picture restorations. In opposition to the cleaning of the Sistine Chapel ceiling he enlisted the engagement of the writer and former art critic of Time Magazine, Alexander Eliot. 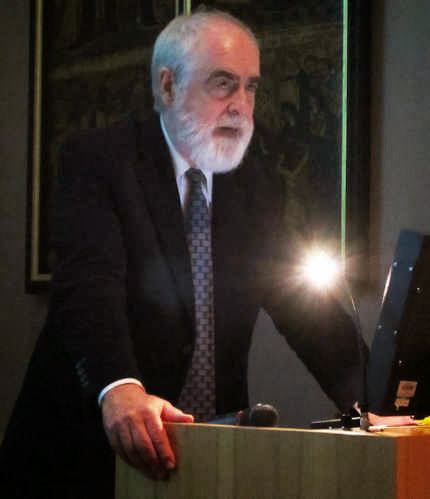 With the philosopher Thomas Molnar and the cultural historian Arcadi Nebolsine, Mason had founded The International Society for the Preservation of Art, which organisation was incorporated within ArtWatch International at its 1992 foundation. 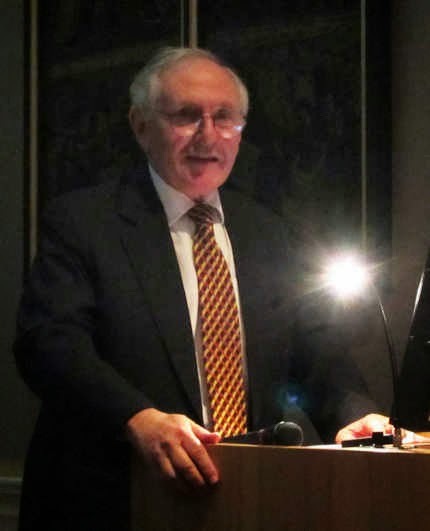 At this year’s James Beck Memorial Lecture we awarded the 2013 Frank Mason Prize to Nick Tinari. 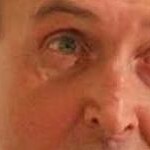 He, like Selby Whittingham (the recipient of the 2011 Frank Mason Prize), has joined our campaign against Glasgow City Council’s attempt to have conditions of Sir William Burrell’s bequest overturned by the Scottish Parliament so as to permit foreign tours of works from the collection. The submissions to the Scottish Parliament made by Donor Watch, Nick Tinari, and ourselves, can be read at this site. Evidence given to the Parliamentary Committee by ArtWatch UK and others can be seen here. 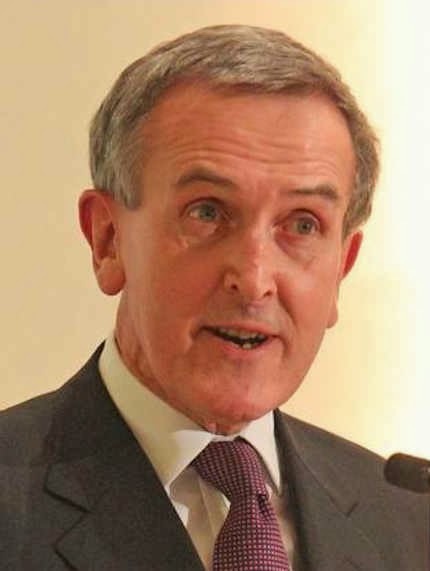 In view of this great familarity with the Barnes case and its clear relevance to present considerations of the private bill presently before the Scottish Parliament, we asked Nick Tinari if he might address that relationship when making his response to receiving the Frank Mason Prize. “I want to thank everyone at ArtWatch for awarding me the Frank Mason prize this year. I’ve worked alongside ArtWatch for many years and they are doing important work that no one else is addressing, namely, protecting our artistic heritage for the long haul, not just for the next exhibition or next year, but for as long as we will continue to recognize artistic genius, which hopefully is a very, very long way out. “In addition to being a remarkable artist and teacher, Frank Mason was an early voice against imprudent “restoration” of artwork. We are in the small club of those who organized protests at museums, his in the 1970s at the Metropolitan Museum and mine in the 1990s at the Washington National Gallery and Philadelphia Museum of Art. 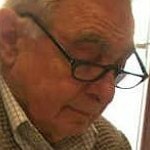 “I met Jim Beck many years ago when I was trying to stop the dismantling of the Barnes Foundation in Merion Pennsylvania. One aspect of the plan to break the founder’s will was an international tour of 80 works from the collection. It was a story that is very similar to the current plans for the Burrell Collection in Glasgow. The trustees no longer had connections to the donor or his intent and they wanted to elevate their own agendas and “put the Barnes on the map,” which was, of course, ridiculous because the Barnes Foundation was world-renowned long before the arrival of new trustees. “I asked Jim for help because the tour organizer, the Washington National Gallery of Art, wanted to remove varnish from many of the works, many of which came into the collection directly from the artists’ studios and thus were in pristine condition, even if not bright enough for the kinds of shows the National Gallery puts on. “This was in the infancy of ArtWatch and Jim wrote some letters and we did press releases together and got some attention to the matter. In the end, the works were not touched for the tour, the rumor being that the French organizers objected to altering the paintings, although some of the same institutions have certainly made their own mistakes since then. “Between 1993 and 1995, roughly 80 Barnes paintings did travel to Washington, Paris, Tokyo, Fort Worth, Toronto, Philadelphia and Munich. Because I did not believe the National Gallery’s officials’ promises about the supposedly careful transit conditions—they actually claimed the works would be safer on tour than in Merion—I examined the works myself in Washington, Paris, Fort Worth, Toronto and Philadelphia. Aided by the condition reports for the paintings prepared before the tour by the National Gallery and which I obtained through the Freedom of Information Act, I documented damage to several works as they were moved from city to city. 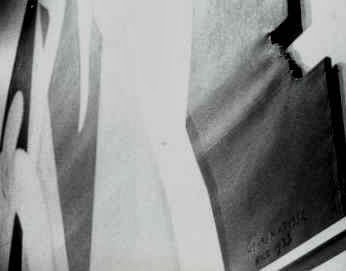 “The most dramatic damage that I saw was in the form of stretcher creases extending the width of one of the four-meter-wide canvas sections of Matisse’s la Danse [see Figs. 24 and 25], which Barnes commissioned for three lunettes in the central gallery at Merion [see Fig. 17]. Contrary to National Gallery testimony that climate-controlled trucks would be used, the large panels were shipped from Merion to Washington in open-air flat bed trucks in 40 degree Fahrenheit weather and then laid flat and rolled up to a special opening in a large window at the National Gallery [see Fig. 19]. I did not witness it, but presumably, a similar procedure was used to move the panels to the Musee d’Art Moderne in Paris. We have photos of the arrival of the panels at the Philadelphia Museum of Art, again on open trucks and again laid flat before being moved into the building. “These photos [Figs. 24 and 25] show the damage as I recorded it at the Philadelphia Museum of Art, where the painting was on display while the remaining works traveled to other cities. The National Gallery’s incredible response was that they simply had not noted the stretcher creases on the original condition reports. This is belied by an earlier report prepared by chief conservator, Ross Merrill, prior to removal of the work from the Barnes’ walls. In the report, Merrill states that the panels were in “remarkably good condition . . . taught and in plane.” An independent conservator, Paul Himmelstein, testified that the stretcher creases were typical of damage caused by laying a work horizontal against its stretchers, especially during a period of change in relative humidity. That is exactly what one would expect in bringing the work from the heated gallery in Merion to an unheated ride down I95 to Washington and then to be laid flat on the ground there. Prior to this, the work had not been off the wall or out of vertical position since Matisse saw it installed in 1934. “A second instance of National Gallery mendacity involved the large Seurat les Poseuses, which a previous conservator at the Barnes Foundation stated should not travel [see Fig. 23]. The National Gallery approved the Seurat’s travel but, remarkably, changed its mind after the work had been to Washington, Paris and Tokyo. 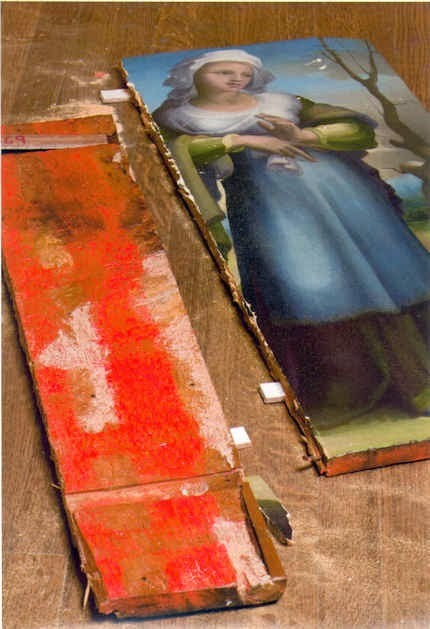 The claim was that the painting was not damaged but just should not travel any further. Of course this makes no sense. Either the painting was in the exact physical condition that it was in when it left Merion and thus fit for continued travel or it had been degraded since Merion, which was why it was no longer fit for travel. I suppose the third option is that, as the earlier conservator observed, the work was never in condition to travel and the National Gallery, having now exhibited the rare work, was willing to reverse itself, while not admitting that the decision to allow travel was wrong from the start. At least for now, the painting has this helpful footnote in its record should the urge to tour it arise again, although, as in the case of the Matisse, it is pretty clear that Alice in Wonderland rules apply to statements from the National Gallery. “The final affront to the Matisse occurred only recently when it was moved from Merion to a new gallery in Philadelphia. As it played out, the agenda to put the Barnes Foundation “on the map” did not mean on a map of Merion, Pennsylvania but five miles away in center city Philadelphia. Anyone interested in the full saga of the complete reversal of Barnes’ wishes that the collection remain in Merion as primarily a teaching collection should view the 2009 documentary The Art of the Steal or consult John Anderson’s recently-updated book Art Held Hostage. 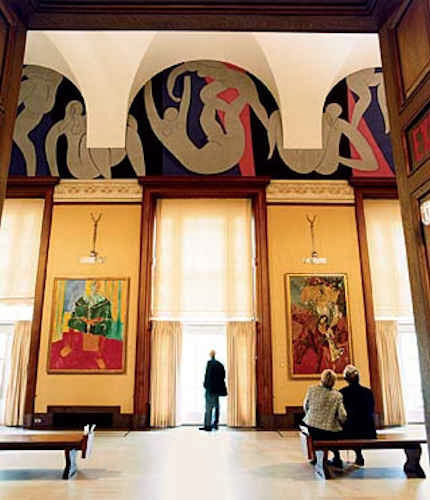 As for the Matisse, the architects and the Barnes trustees responsible for dismantling Barnes’ express mandate for the collection’s use and display did not recreate in Philadelphia the same building details that Matisse worked to. Rather, in keeping with the Modernist design of the new Philadelphia gallery, they eliminated oak moldings above three windows that Matisse clearly used as visual pediments supporting the figures in the mural [see Figs. 17 and 18]. In place of these visual anchors, there is now a wide strip of bare wall with the figures in the work now adrift. This stripping of the Merion details is so obvious a disturbance of Matisse’s harmonization of the mural to the Merion building that it displays the complete and utter ignorance of both the architects and the Barnes trustees, some of whom fancy themselves as “important” collectors, whose mediocre accretions are regularly exhibited with the connivance of the Philadelphia Museum of Art on whose board they also sit. Above, Fig 1. 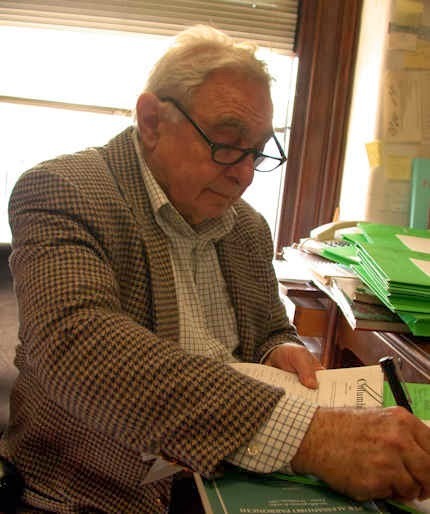 Professor James Beck (born 14 May 1930, died 26 May 2007) photographed in his office at Columbia University by Dr Lynn Catterson. Above, Figs. 2, 3 and 4. 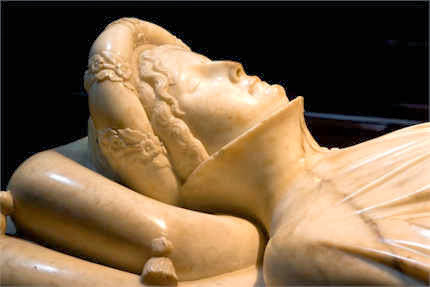 “During the past three decades I have pondered the art of Jacopo della Quercia and have studied his sculptures together with those of his contemporaries, including Donatello and Ghiberti, and those of his followers, chief among them being Michelangelo. I have sought to extract from the documents related to his life and works insights in order to elucidate the art of this Tuscan master. I suggest that I have earned the right to speak in a public forum about his art. In fact, after a dreadfully long space of time, my third book dealing with the artist, a monograph in two volumes [“Jacopo della Quercia”], has finally appeared. “I believe that not only do I have the right to defend his magnificent statues and reliefs against what I believe to be mistreatment, I also have an obligation to do so: if I declined to speak out, it would be I who were negligent. I would have failed in my duty as an academic, as an art historian and as an art critic to express an expert opinion in the marketplace of ideas. This does not suggest that there there are not other expert opinions which might not agree with mine, nor do I claim a special privilege. 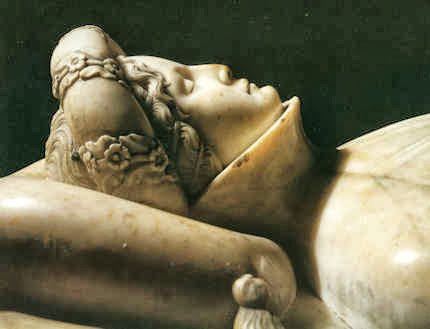 Yet following a scholarly preparation and long experience with the material, and, I might add, a period when I was a student at the Academia delle Belle Arti in Florence, not to have spoken out would have been not merely cowardly, but a dereliction of duty. Above, Fig 10. 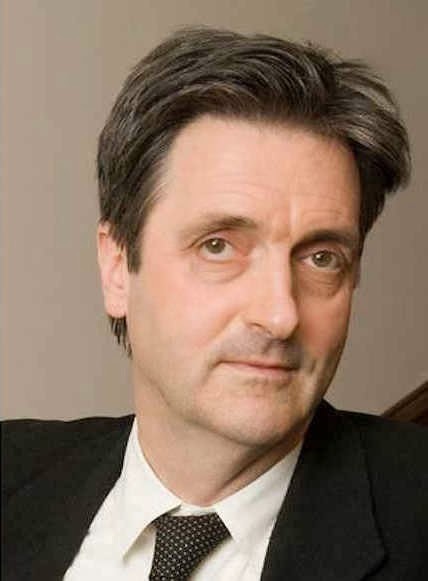 ArtWatch UK’s director, Michael Daley, discussing the origins of ArtWatch International and announcing this year’s winner of the organisation’s annual Frank Mason Prize – Nicholas Tinari. Above, Figs. 11, 12 and 13. Top, Fig. 11, the (late) painter Frank Mason in his downtown Manhattan studio, New York. Centre, Fig. 12, the cast of the Louvre’s Winged Victory of Samothrace in Mason’s studio apartment is one of a number of casts that he had rescued from art school modernist iconoclasts. When Mason’s collection of casts was placed with professional storers while he and his wife, Anne, spent several years in Italy, it was moved on a number of occasions resulting in the destruction of many works (on which rental charges had remained in place). Above, Fig. 13, a detail of Canova’s plaster maquette of The Killing of Priam, a Homeric episode which together with other famous scenes of classic literature inspired Canova in one of his most famous series of bas-reliefs. Two months ago, as described by the art historian and blogger, Tomaso Montanari, the work was detached from the wall of the Academy of Art in Perugia to be shipped, just 24 kilometers away, to an exhibition at Assisi simply titled “Canova”. During the removal operation, headed by the shipping company Alessandro Maggi di Pietrasanta, the unique plaster relief was dropped and smashed beyond repair. Above, Figs. 14 and 15. 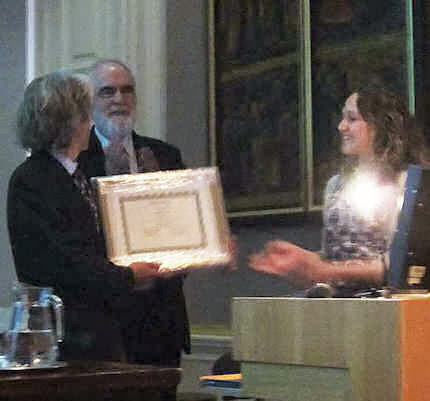 Top, Ruthie Osborne, Artwatch International’s director, presents the Frank Mason Prize on behalf of ArtWatch’s Board to Nick Tinari. Above, ArtWatch UK’s director explains that because the recipient was to return to New York very early the following morning, the first layer of the framer’s conservation-standard protective shield for the certificate had been left in place. Above, Fig. 16. 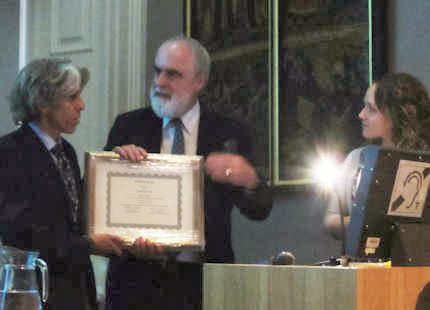 Nick Tinari responds to the award with observations on the similarities between the overturning of the terms of the Barnes bequest and the current attempt being made through a private-member’s Bill in the Scottish Parliament to overturn Sir William Burrell’s prohibition on foreign travels for the works in his bequested collection (see transcript, left). Above, Figs. 17, 18, 19, 20 and 21. Fig. 17 shows Matisse’s specially commissioned canvas mural la Danse in situ at its original, purpose-built classical home at the Barnes Foundation in Merion, Pennsylvania. Fig. 18 shows the work as housed in the new, supposedly replicated, interior of a modernist building in the centre of Philadelphia. Fig. 19 shows the Matisse mural arriving at the National Gallery, Washington, on the first leg of a money-raising world tour in 1993-95. Figs. 20 and 21 show another loaned large canvas painting being similarly man-handled at a French Museum. Above, Fig. 22. Nick Tinari discusses the fate of Matisse’s la Danse and Seurat’s les Poseuses during their contoversial foreign travels. Above, Fig. 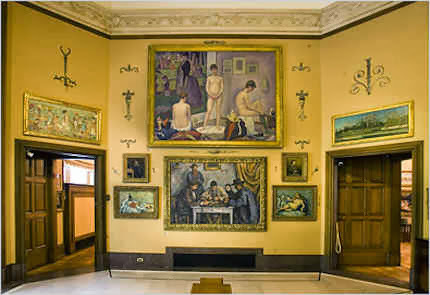 23 Seurat’s les Poseuses (top, centre), as situated in the original Barnes Foundation building in Merion. Above, Figs. 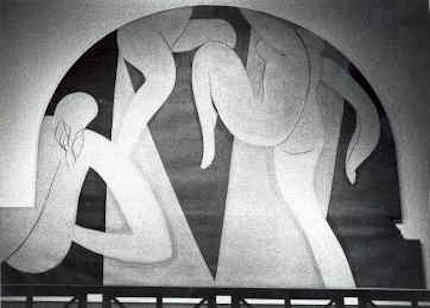 24 and 25, showing damage to a section of Matisse’ la Danse photographed by Nick Tinari towards the end of the dismounted canvas mural’s world tour. Above, top, Figs. 26 and 27, the director of Artwatch UK offers congratulations and thanks to Professor Eidelberg on his lecture. Below, Fig. 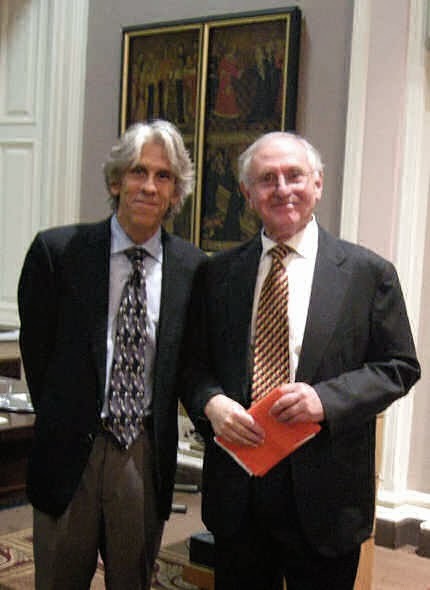 28, TWO FINE FRIENDS OF ART: Nicholas Tinari and Martin Eidelberg, as photographed after the lecture and award ceremony by Peter Strong.